How about organizing a dream wedding in a marquee? Popularity of outdoor wedding marquees has sky rocketed in the years gone by, which has immensely increased demand for wedding marquee services. Marquees add a touch of class to your wedding ceremony. They can add another dimension to your wedding. So, if you are ready to put a little thought to achieve the kind of look you want, your wedding may well become a hot topic for discussion for few months to come. All you need to do is to be a little creative, ask your friends and family for ideas. Yes, there are heaps of ideas and tips at your disposal on the world wide web, but they may seem quite overwhelming when it comes to execution. But nothing to worry about. Our easy to understand tips will make life easy for you. 1.Pick Marquee lining first:- First things first. Your marquee provider can provide you with marquee lining and colored valences. So, choose the one that meshes with the entire setting and reserve them. Not reserving them well in advance might not leave you with right choices. 2.Marquee Ceiling- Marquee ceiling is often overlooked as most of the decoration is done at the eye level. If the ceiling is not decorated well, no matter how nicely rest of the marquee is decorated, it will not be impressive at all. 3.Go for bold decorations- A wedding marquee is no less than a blank canvas, but it is a huge space to be decorated as well, so if you go for mild and delicate decoration, they are more likely to go unnoticed. Do not hesitate to go for bold decorations. 4.Marquee Lighting- Candles can create a romantic atmosphere, but due to the risk of fire wedding marquee hire companies do not allow to use candles. Fairy lights and cordless lamps are pretty engaging, safe and the best alternative to using candles. 5.Hiring Furniture- Hiring furniture from the same wedding marquee hire service will be a good deal as you may ask for some discounts. Besides, you can also be sure that there will be plenty of space for your guests to move around. Do not forget to take furniture’s color into consideration. 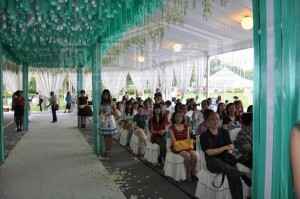 Just follow these simple yet useful wedding event tent/marquees and it will make your wedding event captivating and fun.